Notes from an `Ashurah gathering at Al-Markaz in Bradford. The following is taken from Ustada Shamila's talk on 17th November 2013, entitled 'The Personality of Imam Hussain'. Imam Hussain, radhi-Allah `anhu (may Allah be pleased with him). The leader of the youth in Jannah. 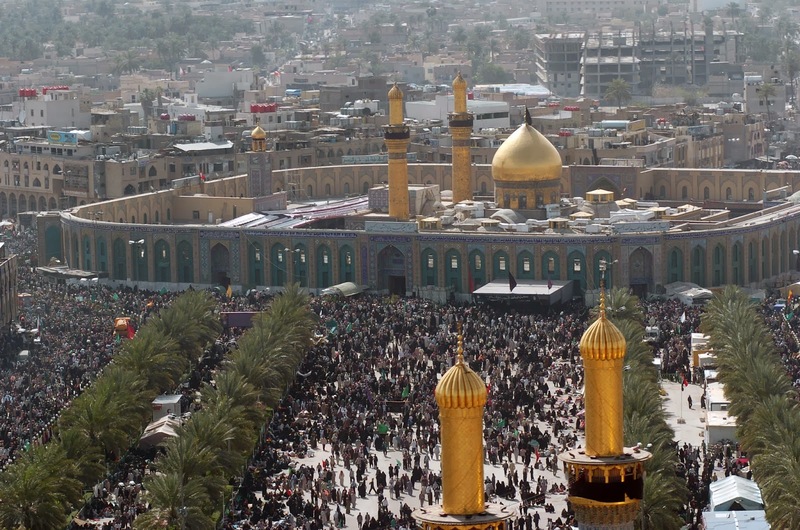 How did Imam Hussain know that he would die in Kuffa? Prophet Muhammad, Allah's peace and blessings be upon him, had said Hussain's demise would be on 'red dust'. And when Imam Hussain reached a land that was a reddish desert, he had no fear in his heart. Prophet Muhammad, Allah's peace and blessings be upon him, said of his grandson, "Hussain milli! Hussain is from me!" He, `alayhis-salam, said the same about his daughter, "Fatima is a piece of me". These gatherings we attend are just an excuse - we should be talking about the 'pieces' of Rasool-Allah all the time. For how else are we going to realistically revive the love for him! Ask yourself, do I love the Ahl ul-Bait? How much do you really know about his family? Did you know he had no shadow? Did you ever feel the way the Sahabah did, who, when in his blessed company, all felt they were loved by the Prophet of Allah? Let's face it. He is The Best. He has the best character. He loved you before you even met. That is the personality of Rasool-Allah. In the same way Imam Hussain is alive in our hearts because we (claim) to love him. So why did he fight, knowing it would be his end? Was it only to fulfil the his `alayhis-salam's prophecy? What is the meaning behind this sacrifice? He, may Allah be pleased with him, had to fight the corrupt Yazeed. And what corruption was with Yazeed! Power mad, and greedy with victory, Yazeed was the man going against guidance, the man whom Imam Hussain had to fight so that you and I can say the Kalimah! He fought for truth and rejected evil because he believed in the unseen, he prayed with certainty and he did not stand by to watch corruption spread. This day is a great day, `adheemun'. It's reported that on the 10th of Muharram Prophet Yunus was relieved from the whale's belly, Prophet Isaa was raised to the heavens, Prophet Nuh found land after the flood and Prophet Musa split the red sea to guide his people to safety. This is not just any tragic day. This day is all about Imam Hussain. But when you Google 'Karbala' for your annual research all you find is Shi'ah dominance. In a month where the Ahl ul-Bait used to be our territory, we find ourselves having to defend our 'Sunnism'. Apart from the historical battle of Karbala-which even British weather chronicles report as the day red dye fell from the sky-, this day needs to be about what Imam Hussayn stood up for. And note this: the ground does not eat up the martyrs. You cry on this day naturally for the loss of an entire family and leaders, but what use is those tears when you don't wake up for Fajr prayer...? Think about that. Zaynab radhi-Allah `anha saw the people grieving at the funeral and exclaimed 'You beat yourself (now)?! Allah's woe be on you!!' Repeating a funeral pyre is not what we do. We are not here to sit. We must stand up. All of this freedom you have, to pray freely, to wear the hijab freely, to be Muslim in public, this freedom cost lives. And we must remember that by doing those things our Imams died for. Imagine that, they died for it, for Allah. `Ali radhi-Allah `anhu married again after Fatima radhi-Allah `anha passed away. His second wife 'Umm Faddal' was also called Fatima, and she said to `Ali to not call her 'Fatima' in front of his sons Hassan and Hussain for they would miss their mother. That is patience, that is love. Imam Hussayn was martyred. Gone. People will die but the message cannot be squashed. Evil will never win for what appeared like a Yazeedi victory was only a postponement of his final defeat. No matter how strong the power looks, darkness will never squash light. There's a Yazeedi and Hussayni nature in every time, in every household. Which one are you going to tap into? Imam Hussayn was the person to give charity at night - why? - so the people wouldn't flatter him with 'Ma-sha-Allah!' He sacrificed himself so that the purity of faith could continue to us, today, to this very moment you're listening. So ask yourself again: What do I OWE myself. Do I miss Zaynab? Do I know she was shackled, all of her family were killed, he hijab was pulled from her - but did she hesitate in faith or negotiate. She was patient. She was the embodiment of Rasool-Allah's sunnah. And this is essentially what Karbala is about for us. In Rasool-Allah's farewell sermon he said a word we forget to mention; "hold onto 2 things and you will not go astray: The Qur'an and my Sunnah - and the people of my house." Allah sent us Rasool-Allah and loving the Ahl ul-Baith (people of 'The House) is obedience to him, `alayhis-salam). Never underestimate the link between one to the other. If Prophet Muhammad was "Kana khuluqul Qur'an", a walking Qur'an, imagine what his daughters, son-in-law, grandsons, great-grandson were like. The two boys riding on his blessed shoulders, Hassan and Hussain, legitimised Qur'an for us because they too are a source of truth. And Allah tested them because he loves them; when Allah grants goodness to someone He tests them with affliction. Be kind like Imam Hussayn. Be generous like Imam Hussayn. Research his life and look deeper into why the greats were just so GREAT. Teach yourself, your family and your leaders to follow the same footsteps and make an impact in your communities. May Allah bring us closer to Imam Hussain and 'Ma-Allah'!' KNOW ALLAH! May every month be one to revive the personality of Imam Hussain, Rasool-Allah and the entire Ahl ul-Baith.